A seminar led by Bruce Schlein of the Citi's Community Reinvestment Act Business Strategy Group on urban sustainable infrastructure. Sustainability drivers, such as the imperative to reduce emissions or better manage extreme weather events, and technological developments, such as advances in photovoltaics, are both turning the traditional construct of infrastructure - centralized, fixed-point service facilities and delivery networks - on its head. Buildings no longer need to be passive end-users of infrastructure; they can be the very infrastructure itself as energy producers or stormwater managers. The potential for sustainable infrastructure to serve as a more economic and environmentally friendly substitute for select modes of traditional infrastructure is predicated on achieving scale; efficiently aggregating decentralized activity across the urban landscape. Aggregation and scale depend on market functions, including finance, modifying approaches that have largely formed around traditional infrastructure. 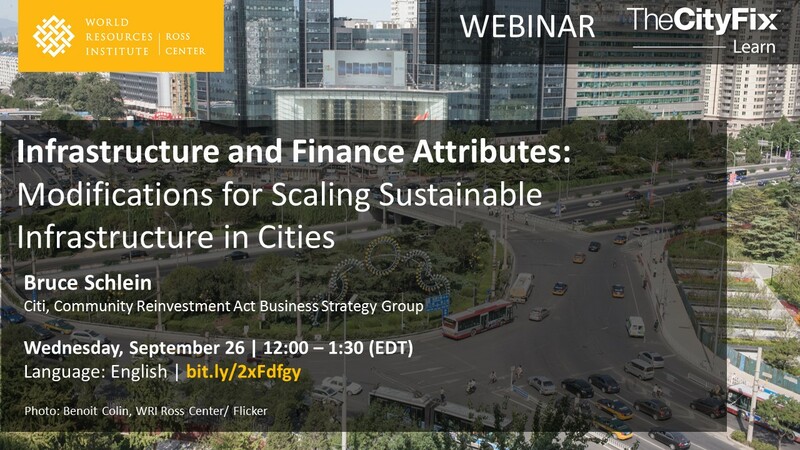 This session explores infrastructure and finance attributes that need to be modified or mitigated to realize the full potential of sustainable infrastructure. Bruce Schlein, a Director in Citi's Community Reinvestment Act (CRA) Business Strategy group, where he develops clean energy solutions for low and moderate income households and communities, having recently transitioned from Citi's Alternative Energy Finance (AEF) group in Capital Markets Origination. Prior to AEF Bruce served as Director of Corporate Sustainability, working with Citi business and operations units to identify and develop solutions for emerging environmental and social issues and opportunities. Previously he worked as a sustainability specialist for Bechtel on petrochemical and civil projects in China and Romania, and for international development agencies including Save the Children, Catholic Relief Services in Bosnia Herzegovina and the U.S. Peace Corps in Papua New Guinea. Bruce is a graduate of Cornell University and holds a Masters in International Affairs from Johns Hopkins Nitze School of Advanced International Studies (SAIS). Bruce serves on the Board of the New York City Energy Efficiency Corporation (NYCEEC).